I use raised beds for the vegetable garden instead of rows, and practice many Square Foot gardening techniques. I continue to expand the number of beds I grow in, but the best way to get more vegetables out of a small garden is by intercropping and succession planting. Sometimes I use a combination of both techniques as I do in my pea beds. In early spring I plant peas on the trellis and lettuce in the front. In one bed, I harvest some of the lettuce and plant bush cucumbers in their place. Later I harvest the rest of the lettuce allowing more room for the cucumbers (intercropping). 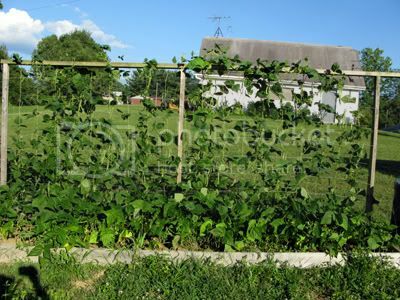 I also plant vining cukes by the trellis after the peas are harvested (succession planting). In the other pea bed, I also plant lettuce in front. I harvest the leaves over and over for my salads and they keep growing back. Eventually when the hot weather decides to stick around and the lettuce gets bitter, I remove all of the plants to the compost pile and plant bush bean seeds there. The peas remain on the trellis for several more weeks. The only caution here is that you have to chart where you put everything if you succession plant with seeds. You also have to remember to warn your kids friends not to step on the new bean seedlings while picking peas! Perhaps the best example of using both techniques simultaneously is with the trellis in this pea bed. Right now I am enjoying the last of the peas on the trellis. 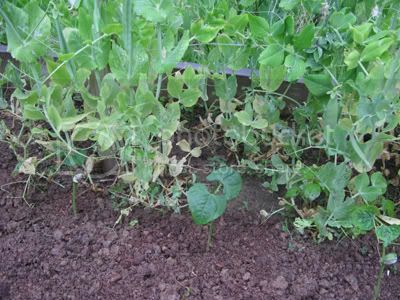 The heat is starting to take its toll on the pea vines and production is beginning to wane. A week or two before I remove the pea vines I plant pole bean plants right along side the peas. Remember the beans that I started in the soil blocks? They are of nice size now so it is time to plant them. It looks funny planting them right in with the mature pea vines but soon the peas will be gone and the beans can take over the entire trellis. See the small bean plants tucked in amongst the peas? Soon I will take all of the pea vines out and put them on the compost heap. That reminds me of a very important part of succession planting. When you start the next planting, be sure to add a generous supply of compost or organic fertilizer to re-energize the soil. Growing many plants in the same space uses up a lot of nutrients. That is okay if you concentrate on feeding the soil instead of the plants - another important key to organic gardening. Growing in raised beds and square foot gardening makes this easier too since you don't have to spread compost or fertilizer over a whole field. 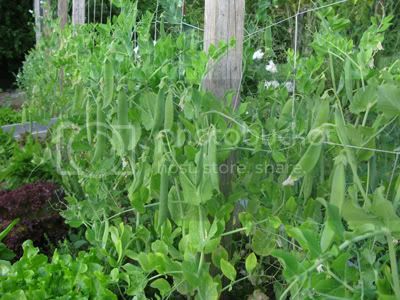 I will post about the pea/bean transition again later to show you how the same trellis can serve multiple needs in the same season. Happy gardening!